Candace H. Johnson-For Shaw Media Lakes Robert King runs the ball against Chicago Westinghouse in the first quarter at Lakes Community High School in Lake Villa. 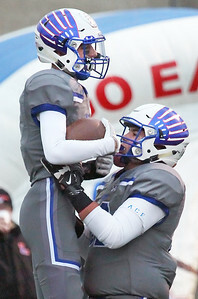 Lakes won, 48-22. Candace H. Johnson-For Shaw Media Lakes D'Lo Mentone Hardy escapes the tackle attempt by Chicago Westinghouse's Calvin Miller in the first quarter at Lakes Community High School in Lake Villa. Lakes won, 48-22. 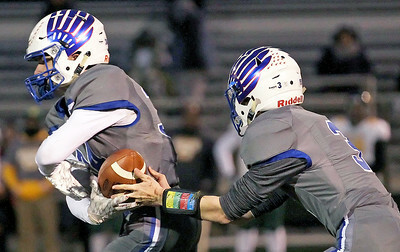 Candace H. Johnson-For Shaw Media Lakes Ryan Carr takes the hand-off from quarterback Chris Selig against Chicago Westinghouse in the second quarter at Lakes Community High School in Lake Villa. Lakes won, 48-22. 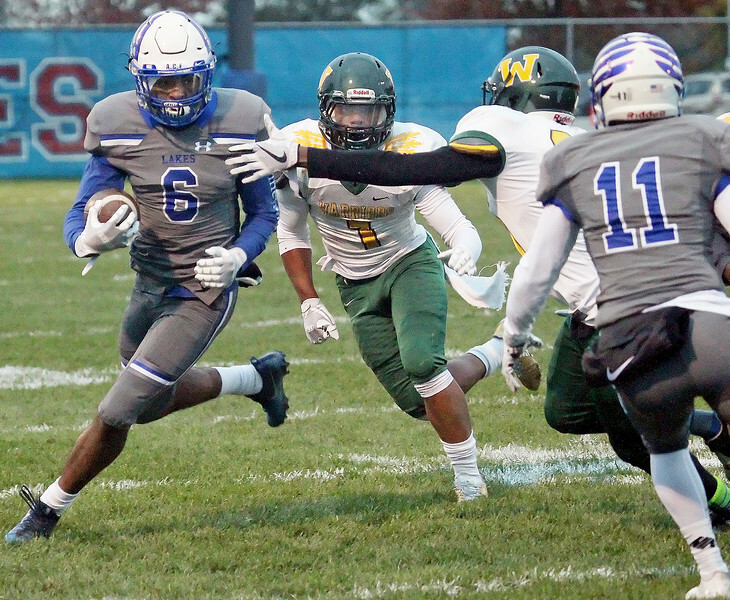 Candace H. Johnson-For Shaw Media Chicago Westinghouse's Tryvis Ousley goes down as Lakes Parking Canning fights for the interception in the third quarter at Lakes Community High School in Lake Villa. Lakes won, 48-22. 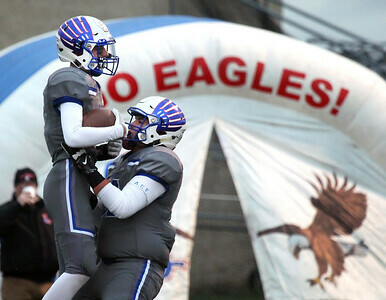 Candace H. Johnson-For Shaw Media Lakes Dylan Keilwitz celebrates his touchdown with Jack Grupka against Chicago Westinghouse in the first quarter at Lakes Community High School in Lake Villa. Lakes won, 48-22. 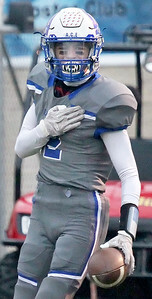 Candace H. Johnson-For Shaw Media Lakes Dylan Keilwitz celebrates his touchdown against Chicago Westinghouse in the first quarter at Lakes Community High School in Lake Villa. Lakes won, 48-22. 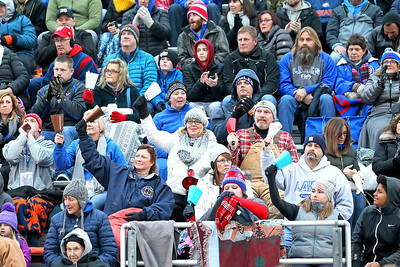 Candace H. Johnson-For Shaw Media Lakes fans celebrate as the varsity football team defense brings down a Chicago Westinghouse ball carrier in the second quarter at Lakes Community High School in Lake Villa. Lakes won, 48-22. 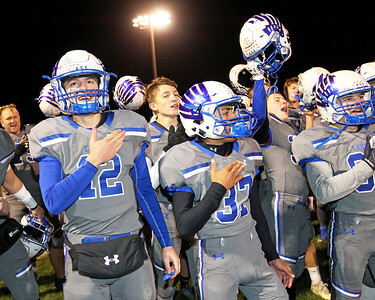 Candace H. Johnson-For Shaw Media The Lakes varsity football team sings the "Fight Song" after beating Chicago Westinghouse in the Class 5A playoff game at Lakes Community High School in Lake Villa. Lakes won, 48-22. 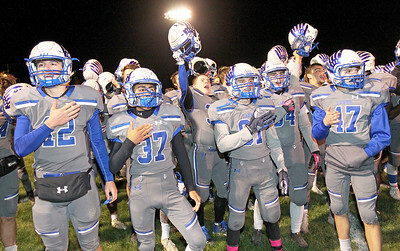 Candace H. Johnson-For Shaw Media Lakes Jake Johnson (on left) and the rest of the varsity football team celebrate their Class 5A playoff win against Chicago Westinghouse and sing the Eagles "Fight Song" at Lakes Community High School in Lake Villa. Lakes won, 48-22. 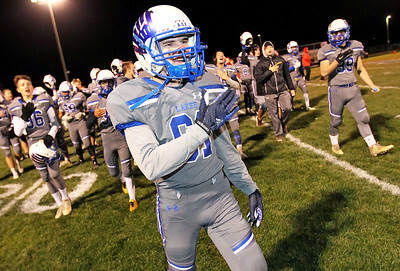 Candace H. Johnson-For Shaw Media Lakes Jacob Kirby sings the "Fight Song" with his teammates as they make their way to the stands to celebrate their Class 5A playoff win against Chicago Westinghouse at Lakes Community High School in Lake Villa. Lakes won, 48-22. 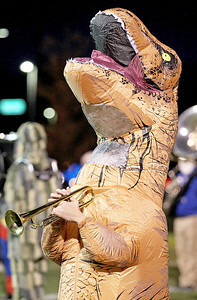 Candace H. Johnson-For Shaw Media Lakes Shane Mortensen plays his trumpet dressed as a T.Rex dinosaur as the Sound of Lakes Marching Band performs at half-time as they celebrate Halloween during the Class 5A football playoff game against Chicago Westinghouse at Lakes Community High School in Lake Villa. Lakes won, 48-22. 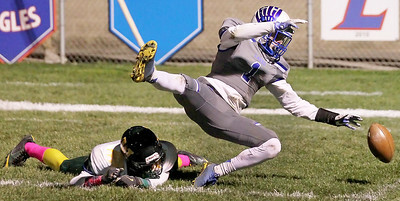 Lakes D'Lo Mentone Hardy escapes the tackle attempt by Chicago Westinghouse's Calvin Miller in the first quarter at Lakes Community High School in Lake Villa. 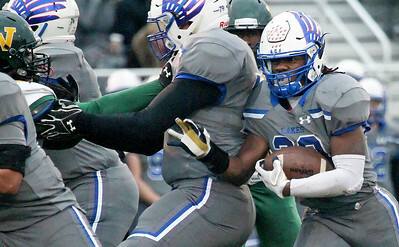 Lakes won, 48-22.